The LS-2000 is as small and portable as a conventional test lung but incorporates an adjustable compliance, variable resistance and a leakage control valve to verify the patient-trigger-function or the leak compensation of a respiratory system. Choose between the Adult (LS-2000A) and the Infant Version (LS-2000I). 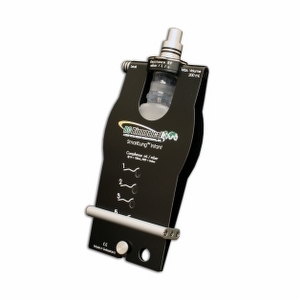 The LS-2000 is the ideal tool for demonstrating and testing all respiratory and anesthesia systems. It works with any ventilator tester, including the TSI CertifierFA©, CertifierFA PLUS© and the Puritan Bennet PTS-2000. This test lung is manufactured in accordance with the CE requirements.